A home garbage disposal unit is an electrically powered device installed under the kitchen sink and that is capable of pulverizing or liquefying food waste, so it can be discarded through the plumbing. Aside from offering practical convenience, garbage disposing units provide an environmentally sound "green" solution to the growing problem of food waste as they eliminate transporting it to landfills, and they help reduce greenhouse gas emissions. ​Furthermore, at capable waste-water treatment plants, food waste can be recycled to produce renewable energy. It should be well insulated against noise. ​It should support continuous feed rather than batch feed. Continuous disposal means that you can keep adding waste while the unit runs. It should have a non-corrosive grind-chamber designed for long term durability. It should be equipped with powerful grinding technology so the food waste is quickly treated. Note that top brands allow you to pulverize or liquefy various foods such as celery, small bones, corncobs, banana peels, apple cores, potato peels, coffee grounds and more. Proper use of these units require avoiding grinding large amounts of these foods all at once and remembering to use cold water while operating the disposer. 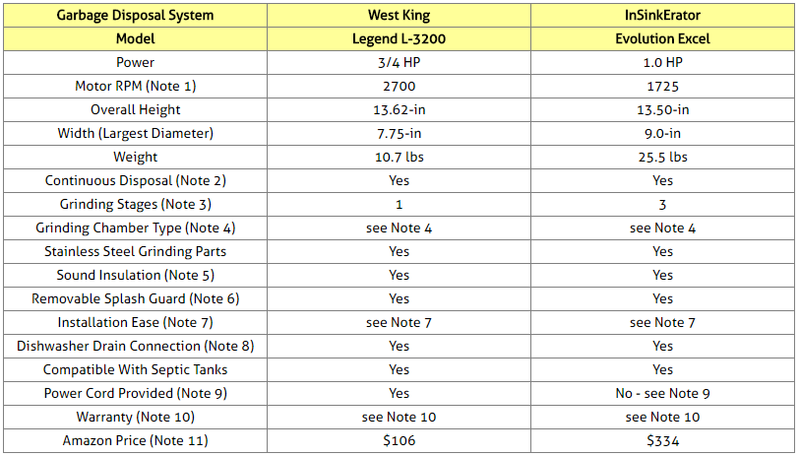 This article will compare Waste King L-3200 and InSinkErator Evolution Excel home garbage disposal systems. These were not just very popular among Amazon customers at the time this article was written, but they had also received excellent reviews from most Amazon buyers. RPM = Revolutions Per Minute. Continuous disposal means that you can keep adding waste while the unit runs. Most garbage disposal units come equipped with a single grinding stage which breaks and pulverizes the food waste into small particles, so it can easily flow into your sewage system. Waste King L-3200 is one such unit. The grinding chamber has a stainless steel turntable, cast stainless steel impellers and a stainless steel grind ring. On the other hand, InSinkErator Evolution Excel features three grinding stages which can handle almost any food waste reducing the chance of clogs and jams. The grind chamber is equipped with a grind-shear ring, a tri-action lug system and an under-cutter disk, all in stainless steel, that virtually liquefy food waste to safely flow into your sewage system. In addition to the three stages of grind, the Excel also includes a jam-sensor circuit that automatically increases torque to break through jams. Waste King L-3200 has a grind chamber made of corrosion proof glass filled polyester. 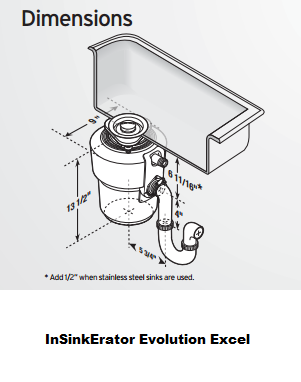 InSinkErator Evolution Excel has a stainless steel grind chamber. In either case, you will never have to worry about corrosion. Waste King is built with a sound shell that helps prevent sound from escaping. InSinkErator features advanced sound reducing technology that ensures less noise than a standard disposer. This technology includes superior insulation around the motor, an anti-vibration sink mount, and an anti-vibration tailpipe to prevent sound transmission from vibrations. The sink baffle also helps prevent sound from escaping the throat of the disposer. This proprietary SoundSeal technology built into the InSinkErator Excel unit makes its operation whisper quiet compared to most other garbage disposers​! The removable splash guard makes it easy to clean. 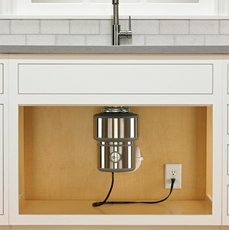 ​Both units come with a built-in spout (or connection) for connecting to the dishwasher if needed, but you may have to buy separately a dishwasher connection kit (adapter, hose, etc.) if not already included with your purchase. Waste King L-3200 already comes with the dishwasher adapter kit, but you may still need to buy a dishwasher connection kit if the dishwasher hose size does not match the included adapter. The InSinkErator unit can simply be wired to your electrical source, but if you prefer to plug it to an electrical outlet, you need to get the InSinkErator CRD-00 Power Cord Kit available on Amazon. Note that even though the Waste King unit comes with a power cord included, you can also hardwire the unit, if you prefer so. The bottom of the unit is removable allowing you to remove the power cord and hardwire the unit to your power source. 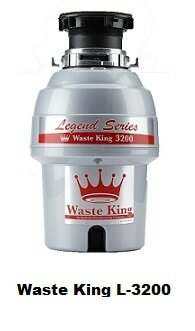 Waste King Legend 3200 comes with an 8-year warranty. The disposer also comes with a lifetime warranty against corrosion. Both warranties are limited to the original purchaser. 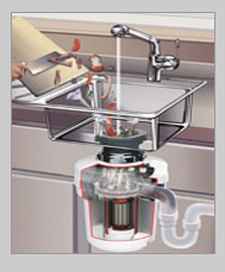 So which of the two garbage disposal systems to buy? The two instant garbage disposers considered here are excellent products as shown by the average rating each had received from Amazon customers at the time this article was written. Indeed, both products had received 4.5 stars (out of 5 stars). There is a good chance that you would be quite happy with either of these two products. 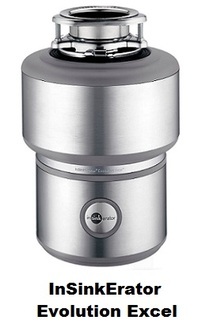 The stainless steel 40 oz grind chamber of the InSinkErator Excel features 3 grind stages that truly liquefy food waste while the Waste King unit is a one stage pulverizer. 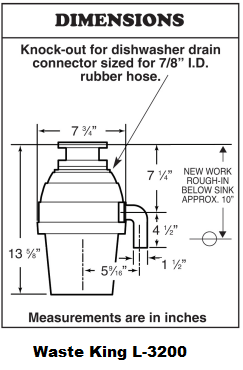 Please click the garbage disposal system of your choice below for price information or to purchase. The InSinkErator unit can simply be wired to your electrical source, but if you prefer to plug it to an electrical outlet, you need to get the InSinkErator CRD-00 Power Cord Kit provided below. You will also find below dishwasher connection kits for both units. The following Watse King garbage disposal units have features similar ​ to those that come with the L-3200 unit, but Waste King L-80000 is more powerful than the above compared L-3200. The other two are less powerful.